MIRABILANDIA – Italy’s largest amusement park, located in Ravenna. Perfect destination for young people but also for families, with many attractions. The most popular are: the Katun, the fastest inverted coaster in Europe, the Ispeed that makes you experience the thrill of accelerating from 0 to 100 km/ h in 2.2 seconds and Phobia that thrusts you into a journey of delirious fear, where the worst nightmare has yet to begin. ITALY IN MINIATURE – Theme Park that for over forty years has made visitors dream. The park covers 85,000 sq.m.and precisely reproduces in scale all the architectural wonders of Italy and Europe. FIABILANDIA – Amusement park about the world of Fairy Tales that will transport you to a parallel world, full of fun and fantasy. All attractions are designed to entertain the whole family, from children to parents, from grown-ups to kids. AQUAFAN – The most famous water park in Europe; 90,000 sq.m. of greenery with 3 km of slides; the funniest are the Kamikaze, the Speedriul, the Extreme River and the brand new Strizzacool. AQUARIUM OF CATTOLICA – LE NAVI – Water park that allows visitors to encounter penguins, turtles, jellyfish, sharks, caymans, chameleons, otters, snakes and many other specimens. Moreover,for the bravest, the park organizes divings in the shark tank for a unique emotion that will make you know the major predator of the seas. OLTREMARE – Theme park in Riccione, divided into habitats and environments, to offer visitors the opportunity to discover many animal species. 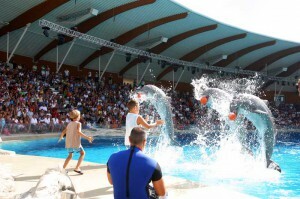 The dolphin Ulysses is the undisputed mascot of the park, and is waiting to entertain you during its show! SKYPARK – The first adventure park of the Riviera, near Novafeltria, with many paths among trees of different heights. It is a park suitable for all ages, combining the love for nature, sport and entertainment.